Ant-Man is the latest installment into the Marvel Cinematic Universe. 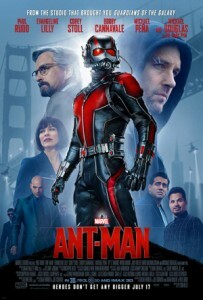 It’s about Scott Lang as he becomes the new Ant-Man, but his troubled past catches up with him when he plots a heist with an older inventor bent on saving the world from certain destruction, so this time his criminal skills are put to good use. 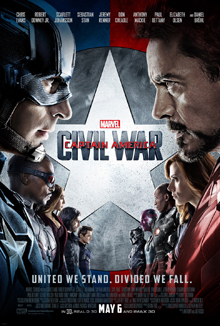 This film is directed by Peyton Reed with a screenplay from Edgar Wright & Joe Cornish and Adam McKay & Paul Rudd. The film stars Rudd (as Scott Lang), Evangeline Lilly, Corey Stoll, Bobby Cannavale, Michael Pena, Tip Harris, Anthony Mackie, Wood Harris, Judy Greer, David Dastmalchian, and Michael Douglas. This entry was posted in Comics, Movies/TV, Reviews and tagged adam-mckay, ant-man, anthony-mackie, avengers, bobby-cannavale, comic books, comics, corey-stoll, david-dastmalchian, disney, Edgar Wright, evangeline-lilly, Joe Cornish, judy-greer, Marvel Comics, marvel studios, michael-douglas, michael-pena, paul-rudd, peyton-reed, tip-harris, wood-harris on July 24, 2015 by Eugene.